Together can Dale and Logan move past the horrific events of their pasts, or are they forever destined to be… Wounded Souls? 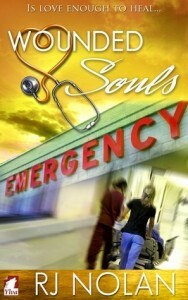 Logan is an ER doctor who travels all over the country filling in for other doctors when they are sick or on vacation. Her new job is in LA and she travels there with her dog Drake in her RV and plans to stay for a few weeks and then move on. Things change though when she meets Dale, a fellow doctor with a secret. Dale was is a vet who waswounded in action but she keeps her leg amputation and shrapnel injuries a secret from all her colleagues. After being injured she needs to be examined by Logan but is not at all happy that she now knows. Dale things she can never have a relationship with Logan as she would be put off by her amputation. Logan has her own issues to deal with regarding the death of her sister and won’t let herself get close to anyone. This is a beautifully told story, weaving survivor guilt, rehab for vets and the body issues that accompany that and an intense attraction between two people who really need to be together. Both women have been so affected by horrible things in their past that neither can just let it all happen. It is obvious they are meant for each other and is so wonderful when they eventually give in to their feelings. The love scenes were tender and very poignant as Dale was so worried about Logan being put off by her amputation. Love won through in the end and it was so wonderfully joyous. A really great book and well worth 5 stars. This is a really well written and certainly well researched book. Although I found the build up to the relationship quite slow the passion was constantly smouldering and tangible. I thought Ms Nolan portrayal of both characters perceived weaknesses and their strengths was exceedingly intriguing and powerfully observed. The subject matter was handled with great understanding, sympathy and respect. Although the women’s growing feelings for each other was at times very emotive and poignant the atmosphere was consistently lifted by the humour provided by the much loved and affable Great Dane. Adding credibility to this novel was the technical medical language used and this certainly added to the authenticity and depth of the storyline. My only hesitation in not awarding five stars was my frustration in the time it took for the two women to believe and trust each other, but this might have been the intent of the author all along! A creative and very enjoyable novel and a real pleasure to read. I really liked this book. The love story was great as we see two very damaged people, both believing they don’t deserve love, unable to stay away from each other because of the connection they share. Some of the things in this story are pretty heavy issues; survivor’s guilt, ptsd, veterans who’ve come home with bodies that are no longer whole. Nolan seems to navigate the issues with a deft touch. It helps that Nolan doesn’t try to tackle these issues immediately after the traumatic incident. Dale has already come a long way with her survivor’s guilt and with adjusting to her amputation. But she’s dealing with body image issues, in part because her last relationship ended shortly after she came home injured. Logan has had two years of running from her own survivor’s guilt, and while the hurt remains fresh, it seems that something inside is ready for a change. One of the good things about this book is that nothing is immediately magically resolved. Both women have to struggle to let down walls they’ve built around themselves, and this in turn leads to quite a few misunderstandings between the two of them. Dale thinks that Logan’s averted glances and reluctance to get close are because Logan doesn’t find her attractive instead of the truth that Logan is trying to push her attraction away. And Logan keeps retreating because she doesn’t believe she deserves to be close to anybody. The only way to get through any of that sort of mess is slowly and inexorably, something Dale does well when she finally figures out that her attraction to Logan is reciprocated. The only bad thing I have to say about the whole story, and let’s face it, if it weren’t written this way then you wouldn’t have much of a story, is that the two seem to have way too many near misses. Times when a truthful conversation or admission from one or the other might resolve things sooner. But human emotion is a tricky thing, and it’s quite possible that moving quicker would have pushed the two apart more than brought them together. Still, there were times that I just wanted to push them into each other’s arms and yell that they were both clueless, or at least wish that Casey would for me. In the end, a very enjoyable read, and I’ll definitely be going back to pick up the first two books.